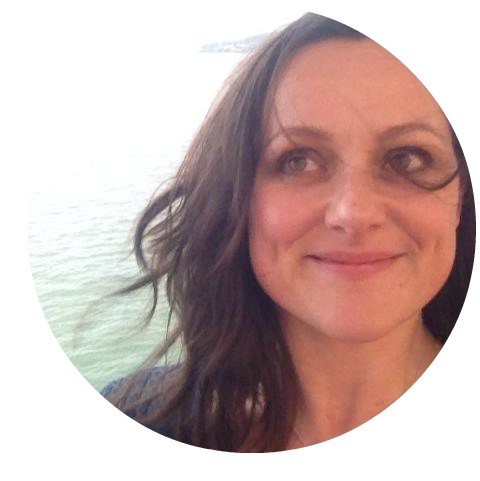 It’s autumn, and I’m thinking about sloe gin and sparkly lights and candles and crochet blankets. 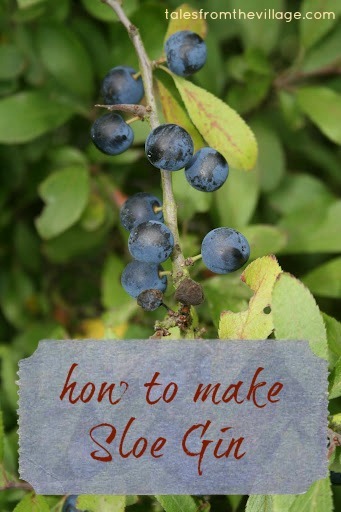 For those of you wanting to know how to make sloe gin, here’s a recipe. Having left it until later this year, the sloes are softer, darker, and they’ve lost their bloom. I’ve always picked them in September, and plonked them in the freezer overnight, because the traditional sloe gin recipe states that you shouldn’t pick them until after the first frost. However, I think the first frost must’ve been earlier than it is nowadays, because the sloes have undergone a transformation and their bitter, dusty taste has been replaced with that of a very tart plum. It’ll be interesting to see how that affects the sloe gin. 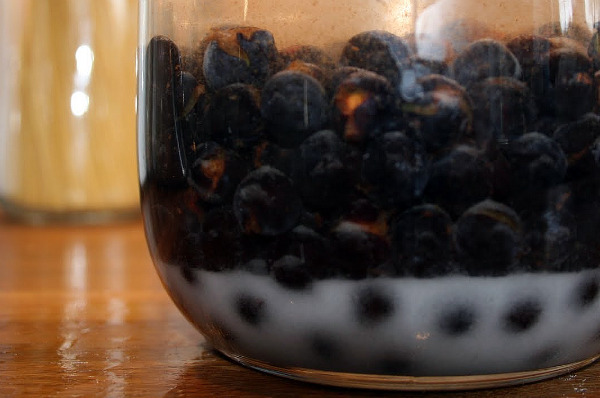 The first thing you need to make sloe gin is – you guessed it – sloes. They grow on the blackthorn bush, and look like tiny little plums, blue-black with a slight whitish bloom. The blackthorn has quite sharp thorns, so be prepared when you’re picking to come home a bit sore. You might also come across a bush with bigger, slightly less tart fruit – these are bullaces. These won’t give quite the same almondy taste to the gin, but they’ll work as a substitute. up in the sitting room with hot chocolate and watched a film. 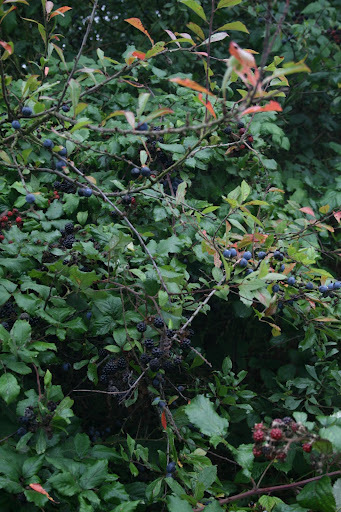 Go and have a look in the hedgerows and you’re sure to find some sloes. Don’t forget a bag. If you’re like me, you’ll forget, and have to take them home in a dog poo bag. This will earn you strange looks from passing walkers. 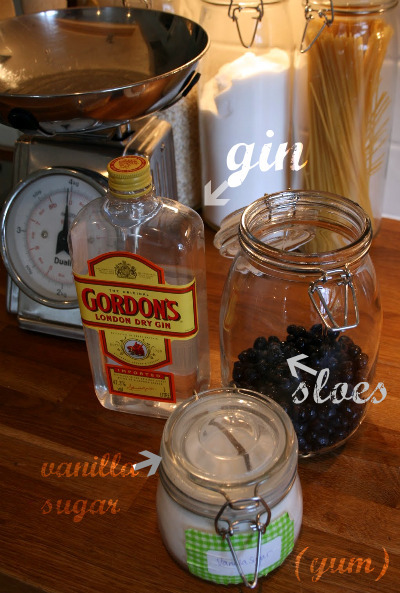 All you need for home made sloe gin is a jar, a bottle of gin, a pound (450g) of sloes and 100g of sugar. Sterilise the jar by washing it in hot soapy water and then rinsing with lots of boiling water. Plonk the washed sloes in the jar, and add the sugar and gin. Strain it into a bottle, and drink. This year I’ve experimented by using vanilla sugar (caster sugar I keep in a jar with vanilla pods) and I’ve added a vanilla pod to the sloe gin mixture, too. Reports to follow in December. This is my entry to lovely English Mum’s Great Big Autumn Bakeoff. It’s not baking, but I’m hoping that a recipe for sloe gin means she’ll let me off! 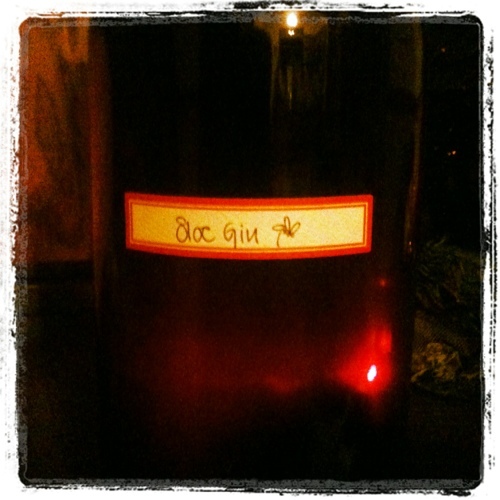 The final result: this is the 2010 vintage, sloe gin made with vanilla. Two years on its absolutely delicious: warm and mellow and just what you need on a winter evening. Happy sloe-picking!